My son is an actor performing today in his last High School production. I could go on and on about how proud I am and about what a great job he did, but I won’t! I have to share a picture of the bouquet my friend made for him! 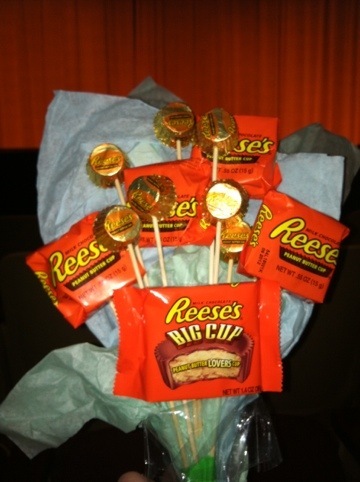 He loves Reese’s Peanut Butter Cups so she used wooden barbecue skewers for stems and made this really cute bouquet. By the way, he was AWESOME! Yes his performance was wonderful–the bouquet sub-par paling in comparison to his talent!! What a cute idea! My 13 year-old-nephew is in a play in May and I have been struggling with what to give him. Not anymore!